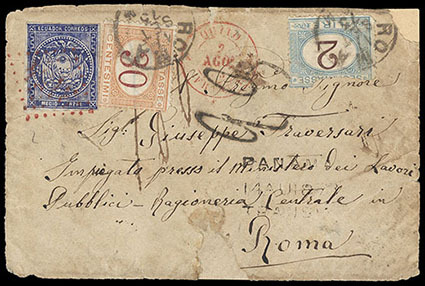 Ecuador, 1865, ½r Blue, clear to ample margins, tied by red "3154" dotted lozenge handstamp on cover front to Rome, Italy, with matching "Quito, Franca, 2 Ago, 73" origin cds at top center, likely carried to Guayaquil and placed in the British P.O. then on a P.S.N.Co. steamer for Panama, with "Panama, Transit, 14 Au 1873" straight line transit date stamp where it crossed the Isthmus and embarked on a British vessel to England, "23" due handstamp applied upon arrival, entered the Italian mails with Italy 2l and 30c Postage Dues applied and canceled by "Roma, 17 Set, 73" cds's; front with repair nicks and Italy 2l due with separation nick at top, F.-V.F. appearance, ex-Longhi; with 2009 Moorhouse certificate. Scott No. 2 Estimate $7,500 - 10,000. ONE OF TWO USAGES TO ITALY BEARING THE FIRST ISSUE AND ONE OF THE TWO EXISTING COMBINATIONS OF CLASSIC ECUADORIAN AND ITALIAN ADHESIVES. Ecuador, 1866, 4r Brownish Red, Horizontal Strip of Five, second printing, positions 96-100, in combination with 1865, 1r yellow buff, vertical strip of three (second printing) on Judicial front to Ambato, all tied by dotted lozenge cancels with matching "Guaranda, 17" Sept cds, manuscript 2lbs14oz weight notation at left; some edge faults and repairs to the front, otherwise Very Fine, the 23r franking pays up to a 46 oz (2lb 14oz) internal parcel rate, ex-Bustamante and Longhi; with 2009 Moorhouse certificate. Scott No. 6+4 Estimate $5,000 - 7,500. AN EXTREMELY RARE LARGE MULTIPLE USAGE OF THE 4 REALES ISSUE. Ecuador, 1865, 1r Yellow Buff, Right Margin Horizontal Pair, margins ample to touching at top left, showing full margin rule in sheet margin, tied by bold sharp "Franca" in dotted lozenge handstamp of Guayaquil on 1873 folded letter to New York City paying the 2r rate up to ¼ oz., with red "New York, Paid All, Oct 1" entry cds, with letter datelined "Guayaquil, Set 9, 1873"; vertical file fold between stamps, Very Fine, one of the latest, if not the latest usage of the first issue, as the second issue had already been introduced in late August of 1873, ex-Lund; with 2013 Moorhouse certificate. Scott No. 4 Estimate $5,000 - 7,500. ONE OF FEWER THAN FIVE FIRST ISSUE COVERS KNOWN TO NORTH AMERICA. 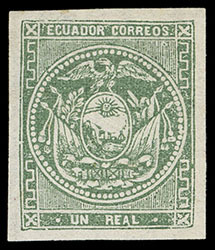 Ecuador, 1865, 1r Deep Green, Two Vertical Pairs, from the second printing, right pair positions 81/90 with the latter showing colorless spot in bottom right spandrel and broken frameline at lower right, clear to large margins, neatly tied by "Guayaquil, 27 Abr, 66" cds's on folded letter to to Lima, Peru, reverse with clear "Peru, 2 May, 66" receiving cds, Very Fine, external mail bearing the 1r green is much scarcer than the latter 1r yellow issue, ex-Longhi; with 2011 Moorhouse certificate. Scott No. 5 Estimate $5,000 - 7,500. THE ONLY RECORDED 1 REAL GREEN DOUBLE RATE COVER ADDRESSED TO A FOREIGN DESTINATION. The great majority of maritime mail to Peru before the autumn of 1866 was carried through the British P.O. at Guayaquil without involvement of the Ecuadorian mail. This is one of the few covers known in this period not entering the British P.O. Ecuador, 1865, 1r Green, Quadrillé Paper, o.g., large beautifully balanced margins, strong bright color, Extremely Fine, ex-Olgieser; with 2003 A.P.S. certificate. Scott No. 5 var. Estimate $5,000 - 7,500. 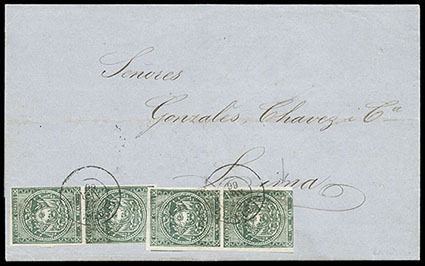 THE UNIQUE EXAMPLE OF THE 1865 1 REAL GREEN ISSUE ON QUADRILLÉ PAPER. The reason for which this paper was used to print the 1r green is unknown, although it may have been an error or an exceptional usage as a result of a shortage of paper during the first printing period. 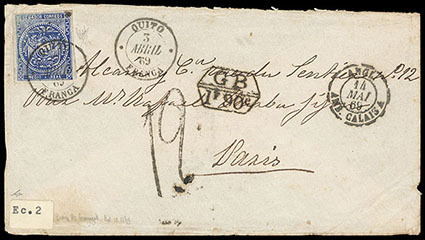 Ecuador, 1865, ½r Blue, intermediate impression, clear to large margins, tied by "Quito, Franca, 3 Abril, 69" cds with second strike alongside on cover to Paris, France paying the internal postage to Guayaquil, routed via British P.O. with "Guayaquil, Ap 10, 1869" double arc cds and red London transit on reverse, bold boxed "GB, 1F90c" accountancy handstamp and "12" decimes due handstamp applied upon arrival; trivial cover edge wear and non-contemporary sticker at lower left, Very Fine, letters from Ecuador to destinations in Europe bearing the first issue as part payment of the postage are very rare, ex-Berkinshaw-Smith and Goeggel; with 1992 Holcombe and Moorhouse certificates. Scott No. 2 Estimate $5,000 - 7,500. 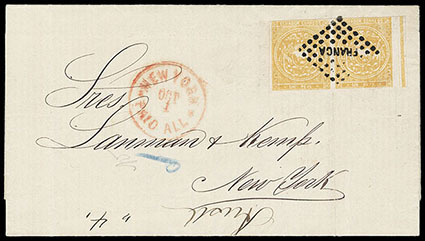 ONE OF SEVEN RECORDED FIRST ISSUE COVERS ADDRESSED TO A TRANSATLANTIC DESTINATION. Ecuador, 1865, 1r Yellow, Diagonal Bisect, bottom left portion of stamp in combination with 1865, 1r yellow on folded letter sheet to Lima, Peru, tied by "Guayaquil, 8 Dic, 68" cds's with clear receiving postmark on reverse, the 1½r franking underpays the 2r single external rate up to ¼ oz. and apparently was accepted or overlooked by the postal clerk who dispatched the cover, Very Fine. Scott No. 4c+4 Estimate $4,000 - 6,000. 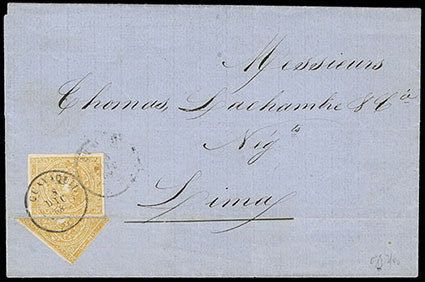 AN EXCEPTIONAL BISECT FRANKING OF THE 1 REAL YELLOW ISSUE AND UNIQUE ON PRIVATE CORRESPONDENCE. 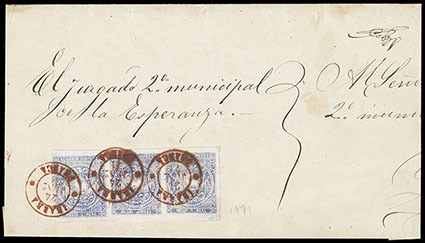 Ecuador, 1865, ½r Milky Blue, Horizontal Strip of Three, ample to mostly huge margins, on part Judicial wrapper from La Esperanza, tied by bold strikes of red "Ibarra, Franca, 24 Juno, 71" cds paying the triple parcel rate for up to 3 ounces, Extremely Fine, this was the first date stamp used at the Ibarra Post Office, being introduced in 1871 and was used in red only, ex-Funkhouser and Longhi; with 2011 Moorhouse certificate. Scott No. 2 Estimate $4,000 - 6,000. THE ONLY EXAMPLE KNOWN OF THE IBARRA TOWNMARK TYING THE FRANKING ON COVER. 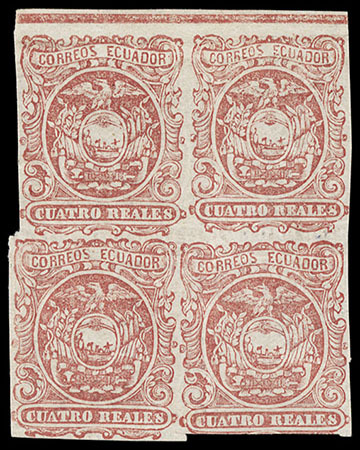 Ecuador, 1866, 4r Pale Carmine Rose, Printed on Both Sides, top margin block of 4 (positions 11-12 & 24-25) positions 11, 24-25 showing "round medallion" variety, small part o.g. (certificate states no gum), margins full to just touching with full margin rule at top, bright color, Very Fine and choice, ex-Lund; with 2013 Moorhouse certificate. Scott No. 6c Estimate $4,000 - 6,000. A WONDERFUL POSITION BLOCK OF THE 1866 4 REALE ISSUE PRINTED ON BOTH SIDES. Ecuador, 1866, 4r Brownish Carmine, second printing, in combination with 1865, ½r blue + 1r yellow buff on Judicial front to Quito, tied by "Guaranda, 19" Mars cds's, manuscript "11 oz" weight endorsement at left, Very Fine, about fifteen three-color frankings bearing the 4 reales are known, ex-Olgieser. Scott No. 6+2+4 Estimate $3,000 - 4,000.